MAY 2007 -- We were all saddened by the death of Carl P. MacLaurin, Past Master of the Connecticut State Grange and Chairman of the State Executive Committee. Once again, one of our leaders is taken from us. When it happens while they are in office, it is doubly onerous. To facilitate the operation of the Board of Directors of the State Grange they have appointed A. Ruel Miller of Cheshire Grange #23 to serve the unexpired term of it’s past member. The board believes that Brother Ruel is well qualified and we welcome him on board. They also elected Brother Phil Prelli Chairman of the Executive Committee and Chairman of the Board of Directors. Brother Gordon Gibson was elected Assistant Chair of the Board of Directors. I know they will both do their best to move the Grange forward. The office of State Chaplain has also become vacant. With deep regret, the Board of Directors accepted the resignation of Marvin Wilbur. Because of personal reasons he feels he cannot perform these duties to his high standards. For more than eight years Brother Marvin has served the State Grange admirably and we will miss his spiritual guidance. The board will discuss an appointment to fill the unexpired term at it’s April meeting. The State Grange encounters many of the same difficulties that our Community and Pomona Granges do. We all just have to pull together and work them out. Fortunately the Grange develops leaders and someone always shows up to step in. Spring is finally here but it doesn’t seem like it. As I write this it is snowing in most of the country and we are told that we can expect flurries on Easter Sunday. The weather does not stop the Grange from performing it’s spring ritual. Inspections are taking place and new members are being received into our Order. I hope we are doing our best to utilize our new members and keep them interested in our work. Keep thinking membership. Speaking of work, Ag Day was celebrated at the State Capitol on March 22. 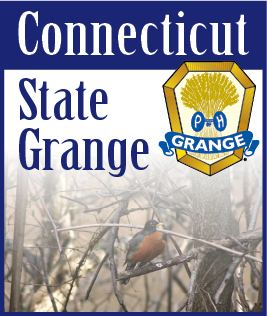 I want to thank Gordon Gibson, Legislative Director and Janet Healy, Agriculture Director for the work they and their committees did to put on a great face for the Connecticut State Grange at this special event. Unfortunately, I was unable to attend but our Past State Master and State Commissioner of Agriculture was there in my stead. Thank you Brother Phil. All of your State Committees are doing great work and you probably heard about it when you attended the Membership and Pink Sash Meeting on April 29th. I can’t tell you how it went or how helpful it was to all who attended as of yet. I can tell you how proud I am of our State Committees. I will give you a detailed account in the June article. In the meantime, I wish you all well and keep thinking MEMBERSHIP!